ChronoSync maintains an exact copy of all the files from your source drive, but what if you want to access older files or files that you have deleted? No problem! ChronoSync saves old versions of your files in case you need to go back in time. 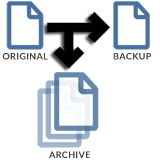 Instead of just deleting files, ChronoSync saves deleted and modified files by placing them in an archive folder. Set the archive options to save older files based on a specific number, length of time, or a combination of both. You can also compress archived files to save disk space. Archived files are accessed in the Archive panel. The list view makes it easy to find, sort, and manage your archived files. Quickly find the file's name, type, version number, archive date, and file date. Then open or restore any older version of a file with one click. Its original location (the source, if this is a backup). Its counterpart (the destination, if this is a backup). A specific folder of your choosing.